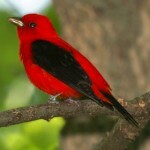 Description: Male is rose red overall with a yellowish bill. 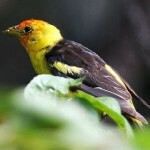 Female plumage varies from mustard to gold below, with darker tinge above (lacks olive tones of female Scarlet Tanager); light yellowish bill. Some eastern females show an overall reddish wash. Juvenile males are patchy greenish-olive and red. Habitat: Mature deciduous forests and bottomland forests. Often nests in tall oak trees. 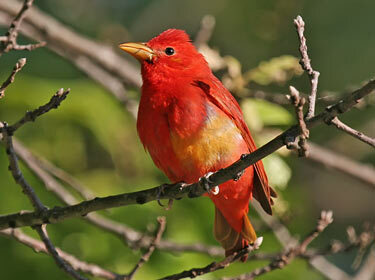 In general, prefers slightly lower and more open woodlands than does Scarlet Tanager. Where in Nebraska: Uncommon spring and fall migrant and summer resident in southeast Nebraska north to Sarpy County. Usually seen near Schramm Park. Rarely seen as far west as Scotts Bluff County. Field Notes: The adult males remain red all year round. Usually forage in the canopy of trees. 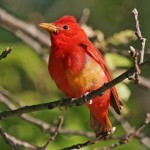 Fun Facts: The Summer Tanager is considered a bee and wasp specialist, often catching them in midflight and removing the stinger by rubbing it against a tree. Then after catching the adults it perches near the hive and tears it open to reveal the bee or wasp larvae.